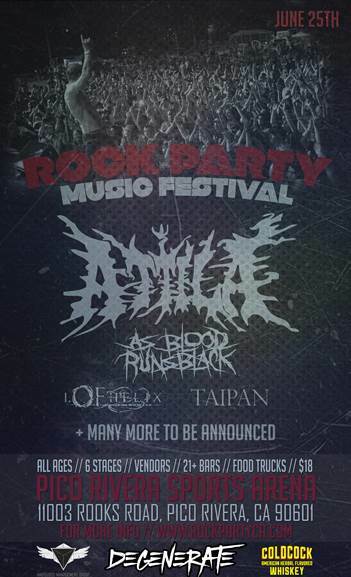 Coldcock Whiskey will be sponsoring the Rock Party Music Festival, which will be headlined by Attila at the Pico Rivera Sports Arena in Pico Rivera, CA on June 25, 2016. The show will feature performances from Attila, As Blood Runs Black, I, Of Helix, Taipan, and many more. Rock Party Music Festival will feature six stages and over 75 bands and artists performing, with food trucks, industry vendors and more. Doors open at 10:00am and the event is all ages with 21+ bars.